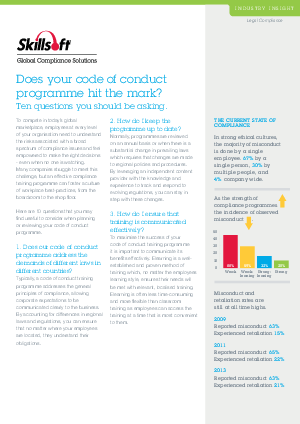 > Skillsoft > Ten Questions You Should Be Asking: Does your Code of Conduct Programme Hit the Mark? Many companies struggle to meet this challenge, but an effective compliance training programme can foster a culture of workplace best-practices, from the boardroom to the shop floor. Download now to learn 10 questions that you may find useful to consider when planning or reviewing your code of conduct programme.